Hydrangeas add a beautiful touch of color to your summer gardens. Their large, fluffy blossoms are hard to resist for many homeowners we meet in Kansas City, and they give your gardens a vibrant appearance that’s both appealing and relaxing. With dozens of varieties to choose from, it’s not hard to find the variety that fits perfectly within your garden. They are easy to cultivate and adaptable to virtually all soil conditions. Hydrangeas are rather easy to take care of in the garden. For the first year or two, and during any droughts, all you have to do is make sure they get plenty of water. You’ll also want to keep them properly pruned. Failing to prune properly for the species you have planted can cause blooming delays. Finally, make sure your hydrangeas have a proper mix of both shade and sun exposure. Hydrangeas need both to stay healthy. 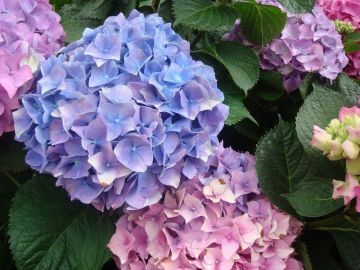 If you decide to plant more once your hydrangeas are established, you can simply divide and layer them using the softwood cuttings, and more will begin growing within about a month. Having trouble figuring out what to plant and how to take care of it this summer? Consult the Rosehill Gardens Plant Care Guide, which is full of the answers you are searching for, or talk with one of our gardening experts at our Garden Center. Our store is ripe with fresh flowers for you to take home, and you’re sure to find a friendly smile to guide you with your summer gardening plans. When is the best time to prune and how to prune Hydrangeas? And when is th best time of year to divide?